Create a Pet Demo and THAT Store item, what a load of crap. Just got back from a lovely holiday in a nice, hot Mediterranean country so sorry for the comments that weren’t approved while I was away. I’m nice and brown but my back is peeling loads thanks to a very addictive book I was reading and couldn’t put down. What a complete load of crap – 400 Simpoints? Really? Has anyone actually bought it? In other news, the revamp of Hidden Springs is coming along nicely. I’ll post more piccies soon. Looks to me a bit like the pet washer that appears in one of the Pets EP promotional videos. There’s a big box that a cat walks into and then a load of brushes and sponges on mechanical arms go in and wash up the cat. Clearly those mechanical arms are so brilliant, they should also be attached to lavatories! 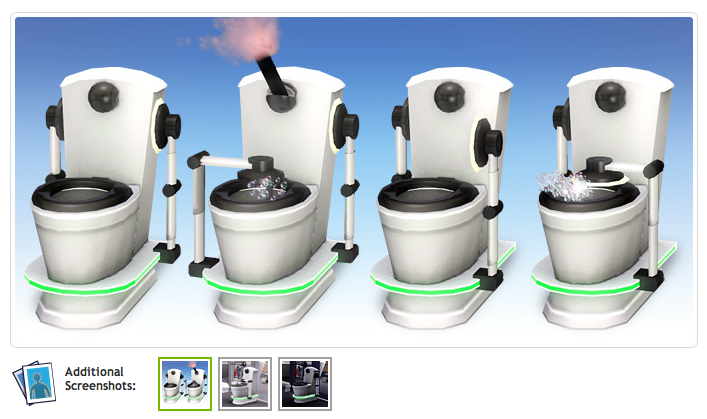 My handy sims can already make bathrooms self-cleaning, so why would you want ugly arms sticking out of your loo?! That’s exactly what I thought when I read the description! I think you’re paying 400 Sim points for some extra animations and the ability to listen to music while you’re on the loo? Great.